I hope you have enjoyed playing around with different samples of fray and cut work. Now starts the fun stuff – adding embellishments – add your own personal touch and in the process learn various embellishing techniques. So an embellishment can be anything that you think is quirky, pretty, stunning or attractive. It is what makes your bag your own. It could be buttons, beads, string, shells, stitched patterns. It can be anything you like. Don’t sew on anything to close to the edges as you don’t want to be sewing over buttons and beads with your sewing machine later on. Consider your overall colour scheme – it is nicer to use only one to three colours to keep things balanced and harmonious. And remember an embellishment is an ornament or decoration. Dont over do it. Let’s start with sewing on some beads. Have a look at one of your samples and decide where a bit of beading would look great. Do you have an idea that jumps out at you? 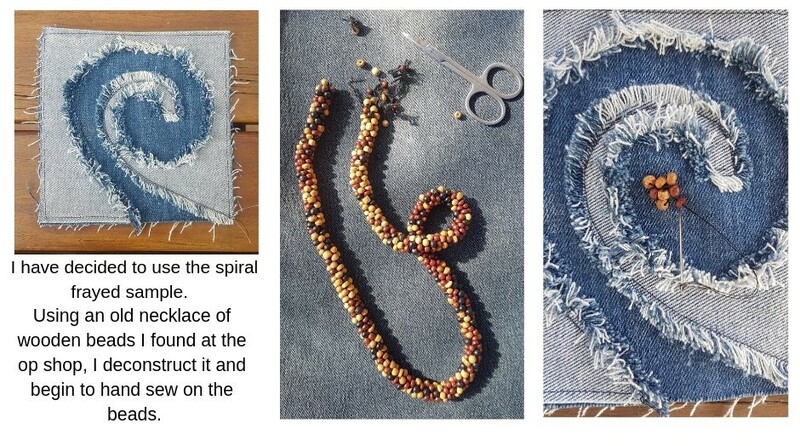 For this tutorial we will keep things simple and just hand sew on some beads and maybe a trinket or two. I hope you are enjoying this so far. Leave a comment if you need some clarification or would like to know more.